Melanie Warner, author of Pandora’s Lunchbox: “How Processed Food Took Over the American Meal” and business writer for the New York Times, reports that processed foods make up close to 70 percent of the US diet. While this figure is high, it’s important to keep in mind that the US Department of Agriculture defines processed foods as anything edible that’s not a raw agricultural commodity, so even frozen fruits and vegetables count. Even though there’s a lot of press about local foods, and foodies seem to be everywhere, statistical trending toward healthier diets is not in evidence. While overall grocery spending is flat, worldwide snack sales rose 2 percent in 2014. And we’re not talking carrot sticks here. One of the biggest additives to processed foods is sugar. According to the American Journal of Clinical Nutrition, people in Western countries consume massive amounts of refined sugar, reaching over 150 pounds per person each year. That averages out to 500 calories just from sugar per day. Many studies constantly point to the fact that large amounts of sugar in the diet can lead to severe metabolic problems. Sugar is believed to be one of the main drivers for diseases like obesity, Type 2 diabetes, high triglycerides and cholesterol, atherosclerosis and heart disease. It is well documented that America has major problems with these three. The Centers for Disease Control and Prevention reported in 2014 a number of chilling statistics. Of the US population, 29.1 million or 9.3 percent have diabetes. One in four Americans died from heart disease, by far the leading cause. And more than one-third of U.S. adults were obese (not just overweight), with an estimated associated annual medical cost of $147 billion. The popularity of processed foods has always been tied to several variables: convenience, taste, and cost. Convenience is directly to time that Americans have to prepare meals. In the short period of five years from 1920 to 1925, the average weekly time devoted to meal preparation went from 44 hours to less than 30. America’s diet was in rapid decline. By the mid-1940’s better living through chemistry was in full force, with hundreds of additives and preservatives now an integral part of our menu, and by 1975 only 10 hours a week were spent preparing and cleaning up after meals. The impact of our reliance on processed and refined foods has been dramatic to say the least. Can all of this change? The answer is hopefully yes – and probably no. Changing diets is very hard. Just ask Jamie Oliver, the British chef. He was motivated to help Americans fight obesity so they could live healthier and longer lives. His plan was to change their eating habits, and his first target was to try to reform the US school lunch programs. His reality TV series: Food Revolution” showed how difficult and painful it is to change habits that are a part of a regional food culture and the bureaucracy of government funded lunch plans. Many processed and fast foods are actually addictive. To add a bit of humor to this sad state of affairs, a 2012 study showed that 52 percent of Americans polled believed that doing their taxes is easier than figuring out how to eat healthy. Add to the mix the recent discovery of a cover-up at Harvard, in which researchers consciously manipulated science in order to increase sugar consumption. And that they did so in the face of scientific evidence that showed (unequivocally) that sugar consumption was associated with chronic disease. Next year will mark 50 years since the sugar industry initiated and funded a literature review absolving sugar of its association with chronic heart disease, without disclosing their role in the study. The sugar industry paid scientists in the 1960s to play down the link between sugar and heart disease and promote saturated fat as the culprit instead, newly released historical documents show. The internal sugar industry documents, recently discovered by a researcher at the University of California, San Francisco, and published this month (September 2016) in JAMA suggest that five decades of research into the role of nutrition and heart disease, including many of today’s dietary recommendations, may have been largely shaped by the sugar industry. This is where the war on Fat that started in the 80’s came from. The sugar industry was interested in increasing sugar consumption by funding science that would urge Americans to decrease calories from saturated fats and hopefully replace them with sugar (which they did). The result was a populous even more over weight and more sick than ever before. For me, fighting the enemy means an ever-vigilant commitment to countering poor nutrition found in the standard American diet (SAD), and educating my patients on healthy ways to fill their breakfast, lunch and dinner plates. That means consuming animal protein, vegetable protein, 5 servings of vegetables each day (excluding corn), 2 servings of fruit each day, and 8+ glasses of water each day. This diet does NOT exclude fats, rather healthy fats from avocado, nuts and seeds and animal protein should be part of your daily intake. 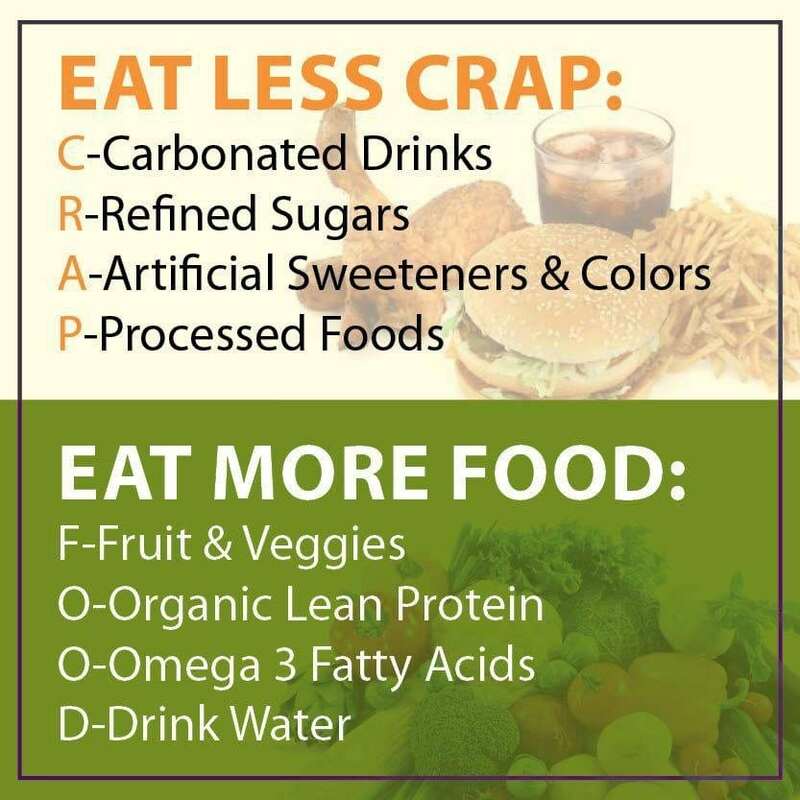 If this is how you eat, you likely won’t be hungry enough to eat junk foods and you’ll feel so good, you won’t ever want to go back to unhealthy processed/fake foods. In an effort to increase their bottom lines, I’m sure this won’t be the only skewed study with which big food corporations will try to fool the American public.